Buddha Tooth Relic Temple and Museum may be one of the relatively newer ones in the neighborhood of Chinatown but that doesn’t necessarily make it any less exquisite. 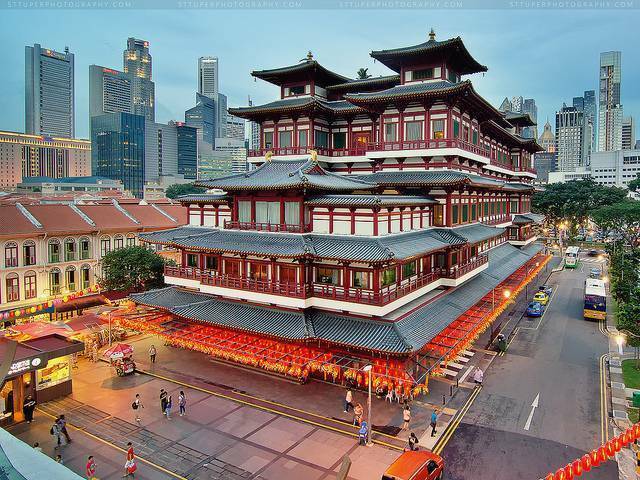 Built in 2007, this Tang Styled Chinese Buddhist Temple derives its name from what is considered as the Sacred Buddha Tooth Relic by Buddhists. With its rich features and exhibits on the arts and culture of Buddhists, the temple is based on Tang dynasty elements & the Buddhist mandala which represents the Buddhist Universe. At the Buddhist Culture Museum located on the third floor, one can find revered artefacts of the Buddha which include tongue and bone relics. However, the temple’s main source of attraction is housed in the Sacred Light Hall, located on the fourth floor. The Sacred Buddha Tooth Relic is placed in an enormous stupa made from solid gold. Other famous attractions include the Eminent Sangha Museum, a theatre which showcases film screenings and cultural performances & holds talks. The rooftop garden with its Buddha prayer wheel and pagoda is an excellent site for some peace and quiet.